Some daughters-in-law hated there mothers-in-law. Not me! I'm blessed having a mother-in-law who loves his son so much that her love for John radiates the same way with me. I first met Mama in the afternoon of October 24, 1993. She's a true "donya", with nails as long as my fingers, hair like that of Imelda Marcos, dressed sophisticated with high heels! I was afraid at first when she talked to me heart-to-heart. But I was wrong all the way. Mama treated me like her own daughter and the res day say is history. Fast forward 22 years after, I haven't seen Mama so engrossed at watching television. Just this year, around August, I found Mama smiling, more like laughing between 12 to 2pm. I got curious; I investigated and found out it was because of ALDUB. Although I'm an Eat Bulaga baby, I haven't been watching the show for over a year due to hectic schedule so I wasn't aware how big ALDUB is already. I only found about this phenomenal love team because Mama talks about it everyday. 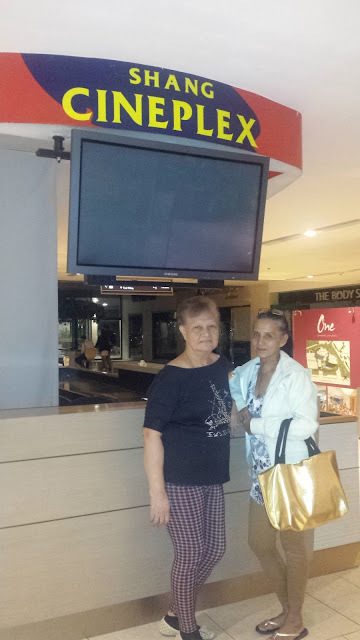 Imagine at 65, a widow for 13 years e kikiligin pa si Mama? Mama just live a floor away from us, but she seldom goes up because of diffivulty walking. Pero sabihin mong, "Ma, may Aldub sa taas, want to watch?". Aba, dali-daling aakyat si Inay! Mama is the kind of person who likes giving. Mahirap din sya bigyan ng gift because she's already happy with what she has. For this Christmas, her grandchildren know how to make Mama happy. We gave her magazines with Aldub as cover. 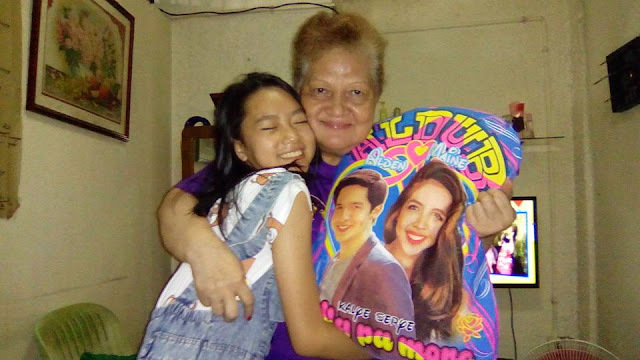 Tita Gaye, Meeca and Gabe gave her an Aldub pillow. Mama told me she was once a fan, a big fan of Susan Roces. She was never a fan of anyone after Susan. And then Maine and Alden Richards came! 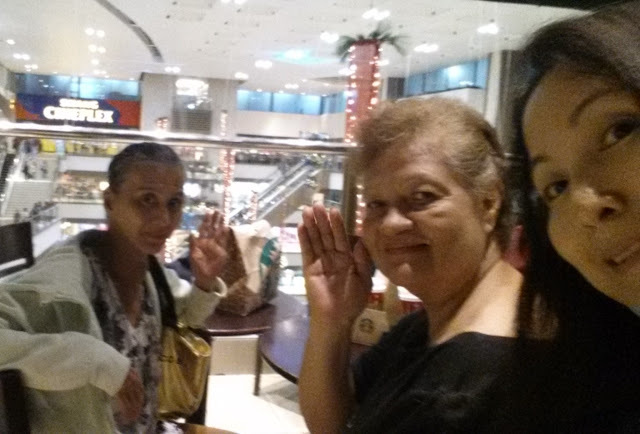 When asked, why she likes Aldub so much, she'd say, "Nakakatuwa sila, bagay sila. Ang ganda ganda ni May (that's how she calls Maine). Mabait pang bata. If she's into social networking, she's probably have tweeted and intagram a lot about Aldub. Her Facebook profile could have been a photo of Maine. She loves Maine so much. Mama also doesn't travel a lot anymore. She just likes to stay home and make sure that our money market (business) is well taken cared of. She only goes on an occasional dinner or lunch out when her two daughters based in the U.S, come to visit her. Other than that she wouldn't mind staying home and watch Aldub or read newspapers and magazines with Aldub in it. 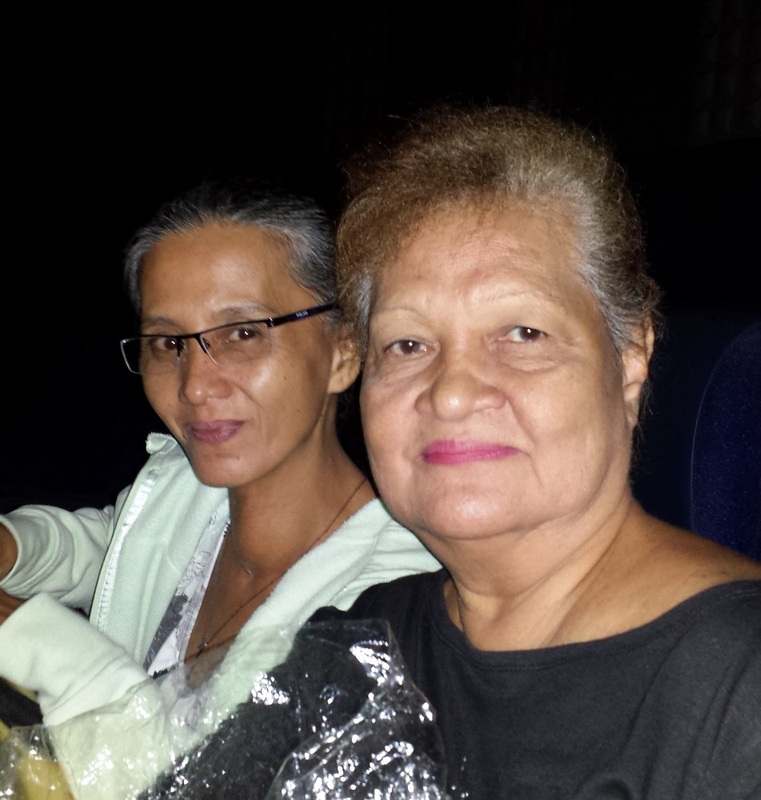 I wanted to return Mama's love so yesterday I asked her out, "Ma, nood tayo". Her eyes twinkled and quickly asked, "My Bebe Love?". I nodded; she shirked like a little girl! Dear Maine and Alden, I hope you get to read this, suntok man sa buwan, dahil sikat na sikat kayo at busy, I hope Mama gets to see you two in person because Mama is a die-hard ALDUB fan.